In our year-end update from about two months ago, I wrote that we were working to make more of our Whitehead letters, essays, photos, and student lecture notes publicly available. 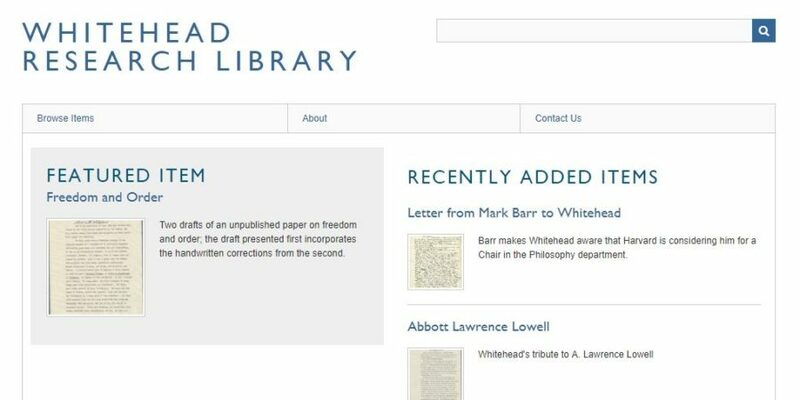 Today I am happy to announce that we are officially launching the digital Whitehead Research Library (WRL), which will make select archival Whitehead materials freely available to view and download. As of now, the WRL contains 46 items. This represents only a fraction of our holdings, but the digitization and cataloging process is time-consuming and costly, and in many cases we are still bound by agreements with other university archives or private donors. You can expect periodic additions to the WRL as time goes by, which will get their own announcements on this blog. This first batch of materials contains some really exciting stuff. I want to first highlight two Whitehead essays contained in the recently discovered Whitehead papers that so far as we know have never been published anywhere. They are entitled “Freedom and Order” and “Religious Psychology of the Western Peoples.” Neither one is dated, and they contain few obvious contextual clues that might help to date them. In both cases multiple drafts are present with handwritten emendations. We suspect that both essays may have been delivered orally at events for which Whitehead was an invited speaker. 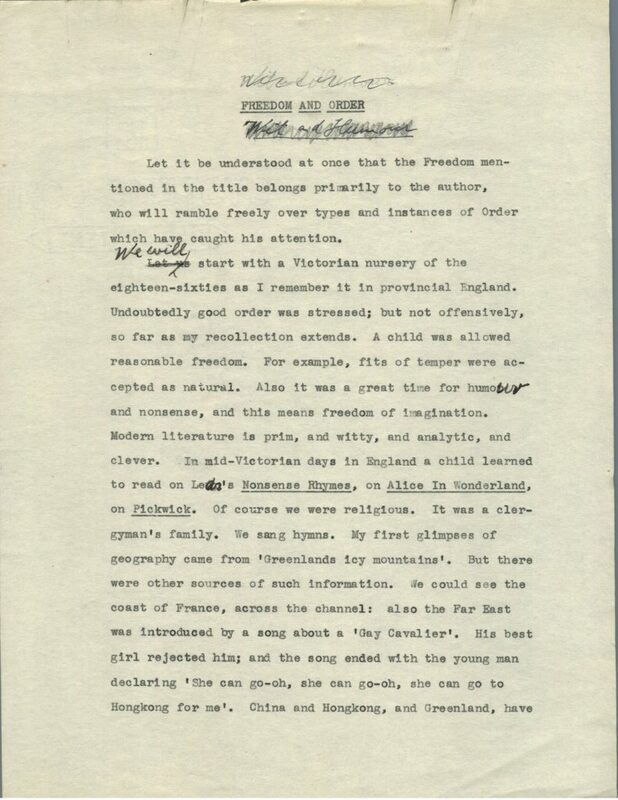 Another item that I want to highlight is Mark Barr’s letter of January 2, 1924, also coming to us from Whitehead’s lost papers. 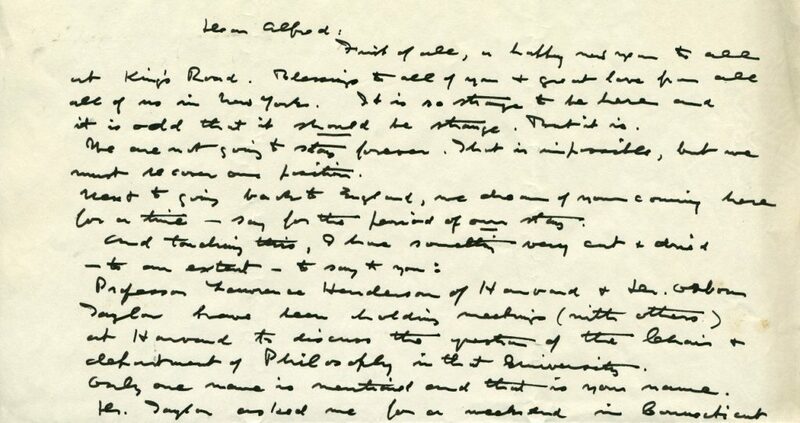 This letter represents the first time that Whitehead had heard that the Chair of Philosophy at Harvard was available, and that he was being considered for it. Victor Lowe knew of the existence of this letter by Barr (see Lowe’s biography, volume 2, page 134), but never saw the letter itself. It is easily one of the most momentous letters of Whitehead’s life, as it began the process that would bring him to America less than a year later. As for the remaining materials, better than half of the 46 items posted here come from an anonymous relative of Henry Osborn Taylor and Julia Isham Taylor—the couple who donated the money for Whitehead’s Harvard salary, and became his close friends. The photos from Columbus Day 1932 have been posted previously, along with a short article providing context, here, while Whitehead’s letters to Taylor from the same donor have never been seen before. 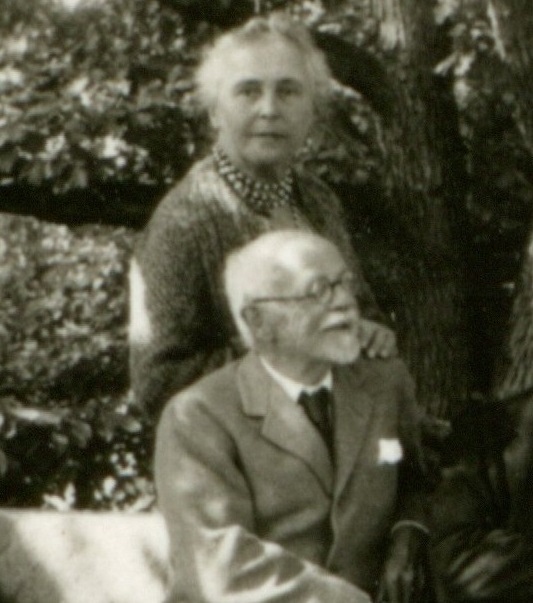 Julia Isham Taylor and Henry Osborn Taylor, who donated the money for Whitehead’s Harvard salary. We are also posting Whitehead’s tributes to A. Lawrence Lowell (Harvard’s president), James Haughton Woods (see our blog post on Woods here), and Philip Cabot (a Harvard Business School professor), and a toast given to Al Smith (former governor of New York and the first Catholic presidential nominee) at a 1929 Harvard dinner. There are also six sets of student lecture notes taken during Whitehead’s classes (some original, and some published previously in Process Studies), along with some other miscellaneous letters, and the previously posted photos of a young Whitehead at Sherborne School in the 1870s. 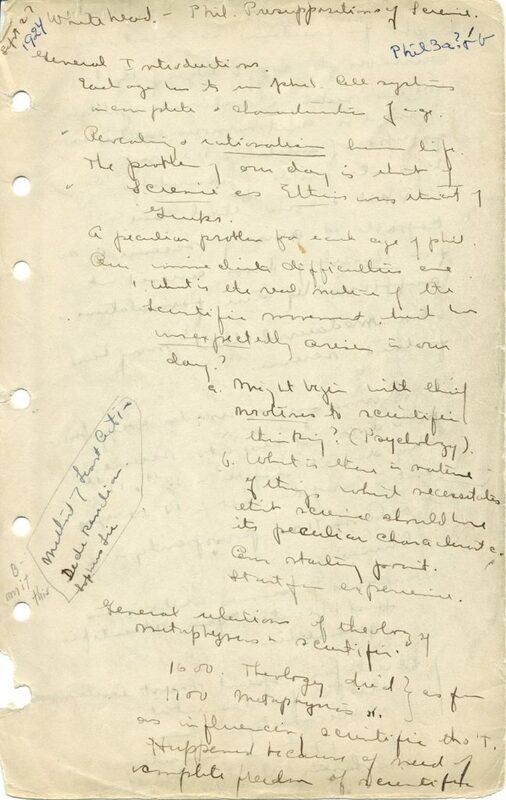 The first page of Louise Heath’s notes from Whitehead’s first Radcliffe lecture. An edited version of these notes appears in The Harvard Lectures of Alfred North Whitehead, 1924-1925, edited by Paul Bogaard and Jason Bell. We’d like to thank Richard Livingston for all his continued and invaluable technical help on both the WRP website and the WRL. We hope that you are as excited as we are to see these new materials. If you have any questions about the WRL or notice any errors or odd behavior, please get in touch using the WRL’s contact form.